Characterizing the conformation of biomolecules by mass spectrometry still represents a challenge. 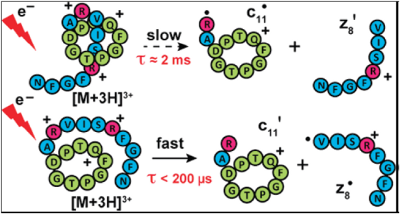 With their knotted structure involving a N-terminal macrolactam ring where the C-terminal tail of the peptide is threaded and sterically trapped, lasso peptides constitute an attractive model for developing methods for characterizing gas-phase conformation, through comparison with their unknotted topoisomers. Here, the kinetics of electron capture dissociation (ECD) of a lasso peptide, capistruin, was investigated by electrospray ionization-Fourier transform ion cyclotron resonance mass spectrometry and compared to that of its branched-cyclic topoisomer, lactamcapistruin. Both peptides produced rather similar ECD spectra but showed different extent of H• transfer from ciˈ to zj • ions. Time-resolved double-resonance experiments under ECD conditions were performed to measure the formation rate constants of typical product ions. Such experiments showed that certain product ions, in particular those related to H• transfer, proceeded through long-lived complexes for capistruin, while fast dissociation processes predominated for lactam-capistruin. The formation rate constants of specific ECD product ions enabled a clear differentiation of the lasso and branched-cyclic topoisomers. These results indicate that the formation kinetics of ECD product ions constitute a new way to explore the conformation of biomolecules and distinguish between topoisomers and, more generally, conformers.